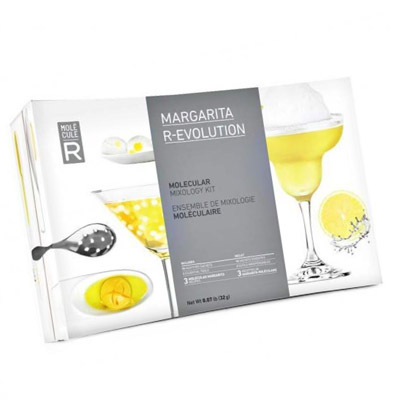 Molecule-R Revolution - Molecular Margarita Kit. Have you ever thought of exploring the world of molecular bartending? 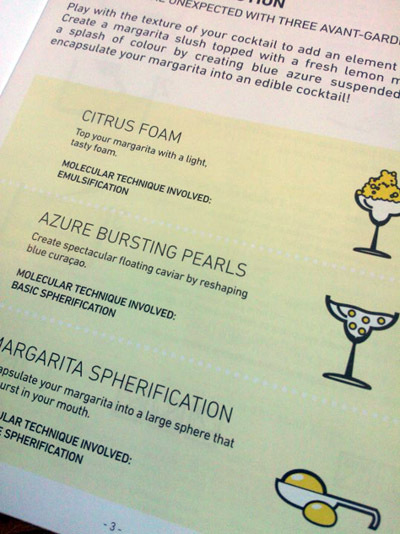 The molecular margarita kit is a great place to start. The classic margarita gets given a novel twist with this cocktail it and you’ll be introduced to three molecular mixology techniques. The kit contains equipment and additives for creating: Lime Foam – top your margarita with a zesty citrus foam Margarita Spheres – cocktail filled bubbles that literally explode in your mouth. Blue Bursting Pearls – floating blue curacao caviar add texture and fun to your drink. Margarita Spheres – cocktail filled bubbles that literally explode in your mouth. Blue Bursting Pearls – floating blue curacao caviar add texture and fun to your drink. The idea behind molecular mixology is to add flare and variety to cocktails, the flavours will still be there (although enhanced by clever use of textures) but the presentation will be something entirely novel. Eating a margarita off a spoon that is encapsulated within a sphere is a unique experience, when you bite down and release the flavour you will really appreciate what molecular mixology is all about. These are all pre-weighed so you won’t need any micro-scales to get the quantities precise. There are enough ingredients included to have plenty of fun and practice and when you need more, replacements are available. 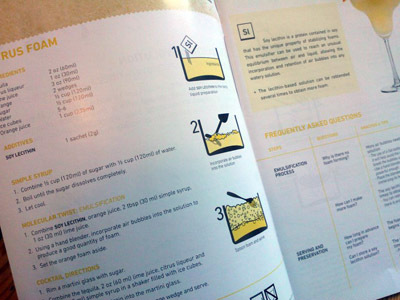 The cocktail kit has instruction, recipes and additives for making three different molecular mixology standards. Cocktail Foam – the citrus element of the margarita is isolated and infused into a light, zesty foam than floats on top of the cocktail. Foams are dispersions of gas into a liquid and are used as garnishes. The fact that they are on top of the entire cocktail mean every sip will incorporate a measured amount of the foam. This foam is made using the soy lecithin and an immersion blender (not included). The density of foams can vary with different cocktails; this is quite a light one. Reverse Spherication – this is the technique that converts non-believers to the merits of the molecular cocktail. The process of making it encapsulates the Margarita within a bubble, so it can be popped whole into the mouth before biting down to release the margarita. These can be prepared in advance and the reverse spheres can be prepared in advance. The basic process is to freeze the margarita and then form a gel around it before it can melt, thus keeping the cocktail contained. It uses the Sodium Alginate and the Calcium Lactate. 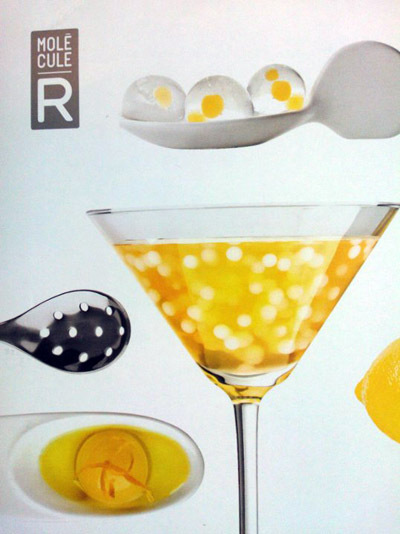 Cocktail Caviar – these fun little balls are great to play with. The resulting texture is just like that of caviar, with a semi-liquid interior that pops in when bitten. They can be served in the molecular drink , eaten of the spoon or used to garnish other molecular gastronomy dishes. 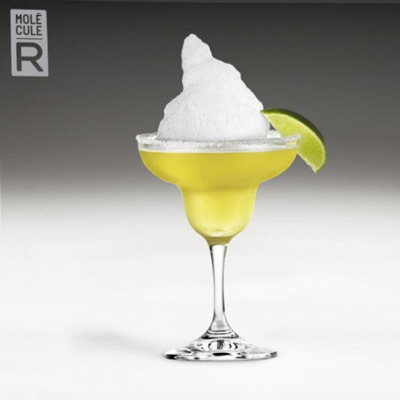 Watch the video to understand the Classic Margarita - then try the Molecular Version. This is an awesome bit of fun. I was given a margatita kit as a gift, and was so pleased that I went and bought tree more kits to give to friends. Ignore the words "molecular mixology" just think fun with cocktails - something like a vodka jelly, but it feels more grown up!